Cook pasta according to directions. When pasta is done, drain and rinse with cold water to stop cooking. Wipe out pot and add chopped bacon to pot over low heat. Let bacon render out until the pieces are very crispy. Remove crispy bacon from pot with a slotted spoon. Add flour and whisk into bacon grease. 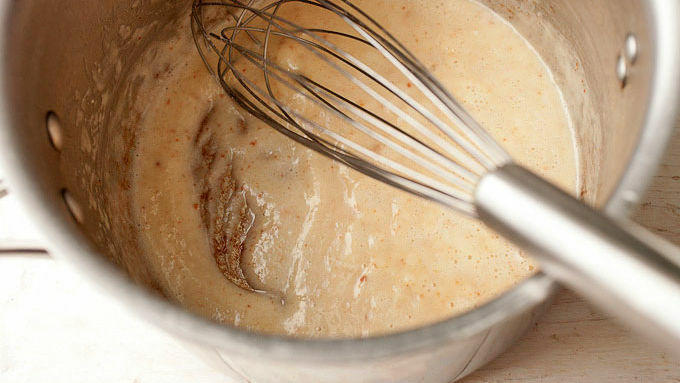 Let cook on low for a few minutes to form a roux (should be a light tan color). Add milk slowly to the roux, whisking constantly, to form a sauce. Once all milk is added to the pot, let thicken and add cheeses. 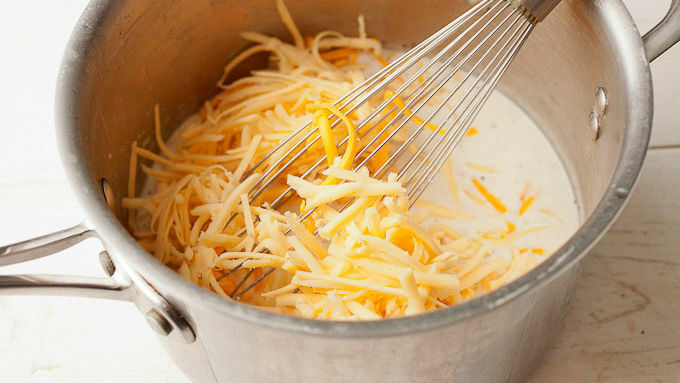 Stir together to melt cheeses well. It should form a thick cheese sauce. Stir in cooked pasta and most of the reserved crispy bacon. Season with salt and pepper. Serve cheesy fusilli pasta garnished with a little crispy bacon and fresh scallion. The sauce will be easier to make if you your milk is warm when you whisk it into the roux. You can use cold milk, but it will take longer to thicken. 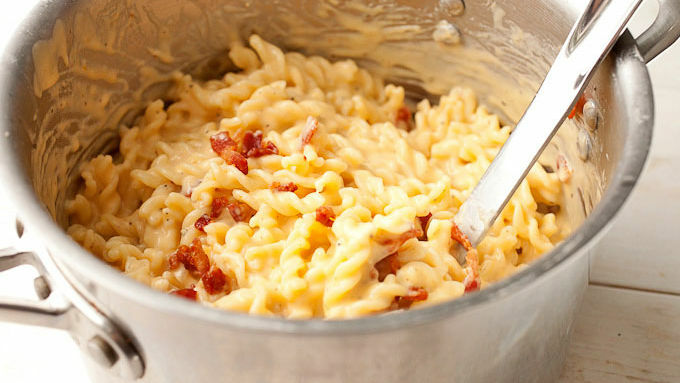 One pot = one delicious cheesy pasta dinner! 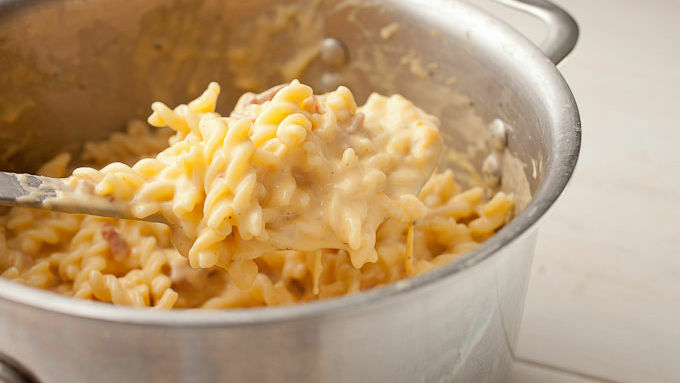 Is there any more iconic American pasta dish than macaroni and cheese? But, let’s be honest, the boxed stuff can get a bit boring. 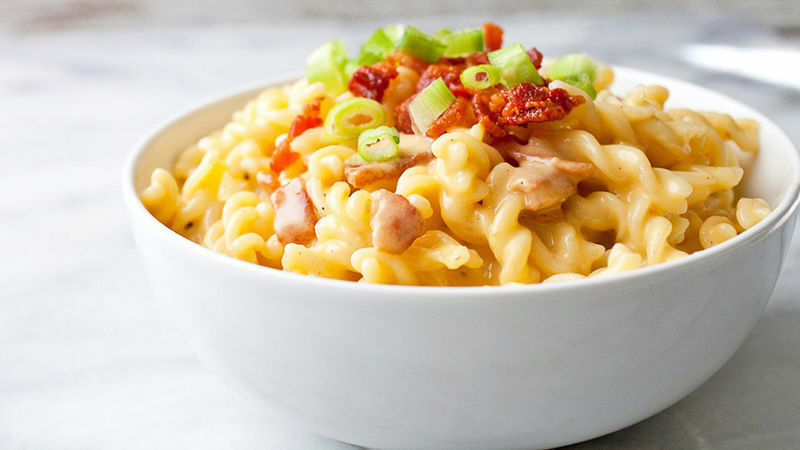 Luckily, with just a few extra minutes (and some really good smoked Gouda) we can take our macaroni and cheese game to another level! 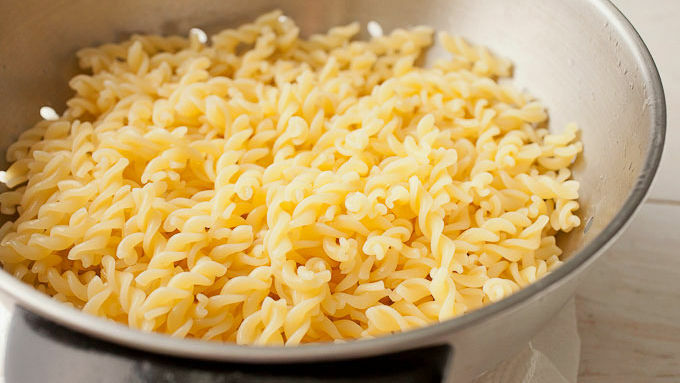 If you wanted make this with elbow macaroni, you definitely could, but the sauce is so creamy that I think sturdier pasta like fusilli works better. This one pot dish is so rich and creamy! Dig in while it’s hot.